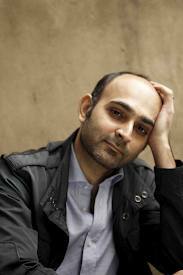 The 2015 Sydney Writers’ Festival Opening Address was delivered by Mohsin Hamid at the Roslyn Packer Theatre on Tuesday 19 May. I find festivals strange, but interesting. Writers’ festivals even more so. Writers and readers are solitary beings by nature, keeping together for the most part, only really coming together at readings, book launches, reading groups and the like. But a festival throws them together, all sorts of readers and writers, some you know, some you may have read but many you may not even heard of before the publicity email arrives in your inbox. Should you meet a writer, listen to them talk, discuss international or gender politics before you have finished reading a single book they have written? It’s not the way we traditionally get to meet a writer. And so I approached the opening address of the 2015 Sydney Writers’ Festival thinking at least I had read The Reluctant Fundamentalist and had seen Mohsin Hamid on Q & A the night before. But first, of course, being the launch of the festival we had the speeches – The Festival Director, The Minister, The Lord Mayor – The assistance of the Australia Council was mentioned and there was a little movement in the seats, a few breaths were held and the potential crisis swirling around arts funding in Australia was acknowledged in a very politically discreet manner. Then finally Mohsin Hamid made his way on stage to give his address which we already knew was entitled ‘Life in the Time of Permawar’. Permawar is, at least on one level, an easy term to understand, but it can mean different things to different people, different cultures, different countries. In the West it can means being scared of being the victim of a potential act of violence or of being told by your government that people other than us want to hurt us. For someone in the ruins of a town in Syria, or Iraq it can mean something very different. But Hamid approached this question in an interesting way. His address was not a traditional speech. It was a story, a piece of what might be described as creative non fiction. And it was in six chapters. There is a difference between reading and listening. When you read you can go back and reread, dig deeper, notice little things that you may have missed the first time round. But when you listen the story washes over you. You remember images and try to piece them together. You make the story your own quicker than you can with a written story. On the train travelling home I thought of Hamid’s story, his opening speech in six chapters. It was about death, which is an appropriate theme for a serious writer and even more appropriate for a festival which includes Caitlin Doughty, mortician and author of Smoke Gets in Your Eyes: And Other Lessons from the Crematorium (http://www.orderofthegooddeath.com/). Hamid observes death stalking humanity from a “nook” high up on a cliff. I had an image of an old Western movie, of Buffalo Bill riding through the herds on the plains taking out buffalo while Hamid watches from a nook high up on the cliffs. But then this image is inverted and I’m told to image a solid ball of thousands of silver fish as sharks circle and snap up any fish that spins out of the ball. Death we are told stalks all of us – we all fish. The chapters spin past me. I remember images, snippets more than the complete story – watching pirated pornographic videos smuggled past firewalls in Pakistan. The rise of the cyborgs – the search for immortality by becoming a machine, breaking us down into atoms born in a distant star which continue to travel the universe long after we have been taken by a shark. Then finally fiction – what has this to do with writing, beyond the fact it is a piece of writing in six chapters? It is the story that keeps the mass of fish together, the stories/the fictions that make the individual important, that makes each fish in the solid mass of fish important. In a time when the sharks are many and hungry it is these stories that can change things. A story can’t change the world – but it can change an individual and together individuals can change the world. In the end this is what Hamid leaves us with. Obviously this speech will be published at some stage (I couldn’t find reference to it on-line yet) and I’ll have a chance to reconcile my initial response against a real text. In the meantime it is perhaps fitting that the 2015 Sydney Writing Festival has been launched by a speech/reading rich in imagery and layered in meaning. This entry was posted in Issue 14, Mohsin Hamid, Sydney Writers' Festival and tagged Creative Non-Fiction, Festivals, Permawar, The Reluctant Fundamentalist by Mark Roberts. Bookmark the permalink.